Define the lines that frame your face with our Moodstruck Precision Brow Liner. Use the pencil to fill and shape brows that comes in three perfect shades for any hair color. 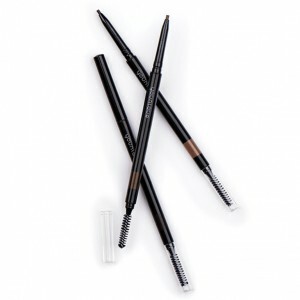 Four times smaller than standard brow pencils for a sleek, precise application, this brow liner is long-wearing, smudge-proof, and made with a waterproof formula. Don’t forget to tame those brows with the included spoolie for an expert finish. First, pluck any stray hairs with the new Precision Tweezers. Brush brow hair up with spoolie and draw a thin line along the hairline following the lower arch. Finish with Moodstruck Precision Brow Gel. My Review Of The Younique Precision Brow Liner: My eyebrows have issues, they are super light and a bit unshapely. In the past I have tried dying and waxing them, I have even had them tattooed by a permanent makeup artist, nothing has been a good or easy solution. When I heard Younique was launching brow products I was so excited. I have been using one of our precision eye pencils for my brows and it works well but there is only one shade. The Younique Precision Brow Liner comes in Light, Medium and Dark , I got light to go with my blonde hair and fair complexion. The light is very light though so I plan to also try medium. The first think I liked about this is that the liner is a very fine tip which makes it easy to apply much like your brow hair so it looks much more natural. The included spoolie is also helpful for making the liner look natural once applied or before. The Brow Liner itself is great for shaping and defining brows or even filling in sparse patches, but the Precision Brow Gel really does finish the look perfectly.